Me and Josh had been out all day on Saturday at the 1 year anniversary event at a Games shop we know in Norwich called Athena. There was cake and lots of board games – and all in all we had a really good time! Afterwards we went down to riverside to grab some dinner before heading home and we decided to go to TGI Fridays! They are one of the newer restaurants to open at Riverside and do some of the best burgers. I decided not to have a starter this time as I knew how big the burgers were! But Josh went with Garlic Ciabatta with Monterey Jack cheese which he said was awesome! On to our main courses. Currently, TGI’s are running a tapas promotion which you can find on their website. This looked really nice but what we came for were the burgers! 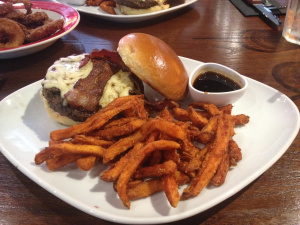 Josh’s choice: Fridays’ Double Glazed Jack Daniel’s Burger with Jack Daniel’s glaze, Monterey Jack cheese, Jack Daniel’s candied bacon and Fridays mayo. 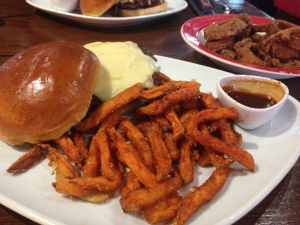 Josh also upgraded to having sweet potato fries which he described as “frickin amazing” so I guess thats a winner! All the burgers are served in a really nice squishy brioche bun which is a nice touch. My choice on the other hand was the French Dip. A juicy beef burger topped with caramelised onions, swiss cheese and garlic mayo. A french dip burger traditionally means that the top half of the bun is dipped in the juice that has run off the burgers during the cooking process but TGI’s served it on the side so you can add it yourself or dip your burger in it. I have to say that sauce was so delicious – I did pour it in my burger but I also dipped my chips in it too as it was so tasty! Also had the sweet potato fries like Josh – really really tasty. Note: Although this post is now live (Saturday 8:30pm) I am actually away at a festival in Somerset at the moment. Of course I will blog all about it when I get back but for now – sorry for my lack of posting! Back on Tuesday! ← Happy Birthday Kerry – Our meal and cocktails!